Playa Herradura is a high-end coastal town anchored by The Mariott’s Los Suenos Resort. Herradura is known for its 18-hole golf course, beaches, various upscale restaurants, and some of the best sport fishing in the country. 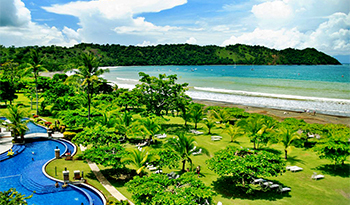 All of these features make Playa Herradura among the most coveted beach towns in Costa Rica. Many residents in Herradura believe that it pays to be near the Los Suenos Resort, and real estate prices in the area reflect the same. Thus, the homes located on the Los Suenos property come at a premium price. That said, there are also villas, condos with ocean views, beachfront cabins, single family homes with 1-3 bedrooms, and larger luxury homes throughout Playa Herradura. Regardless of where one stays in Playa Herradura, they can appreciate the beaches and overall vibe of this high-end, coastal town.